Do your pivots wabble and your casters worn out or missing? Have you lost your splice? Upgrade your old Expandable width Base Beam assembly with a refurbished version. The Base Beam comes fully assembled and if your old beam is in good condition you can return the complete assembly with the prepaid shipping label for up to 10 dollars credit toward your next purchase. 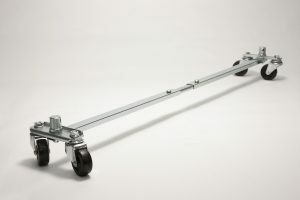 This replacement Expandable Base Beam will give you back confidence and the bright look for your AllDolly.